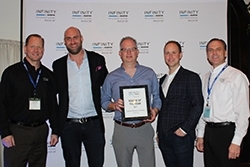 Lifetime Windows & Doors wins Marvin’s prestigious “Rookie of the Year Award” at the Infinity from Marvin Executive Forum. Phoenix, AZ, February 07, 2018 --(PR.com)-- This year Marvin Windows held an executive forum in Phoenix for their Infinity from Marvin fiberglass window dealers. Marvin has been in the window business for over 100 years, and in 2002 they created their Infinity line after recognizing an opportunity to offer high-end fiberglass windows to homeowners. Lifetime has been a proud distributor of the Marvin replacement windows in Colorado for years, and saw an excellent opportunity to open in the Phoenix market last January. “Winning the Rookie of the Year Award just further confirms what we knew all along, that the people of Arizona needed a new window option. We are proud to offer them something that is not only high-quality, but will save them money in the long run,” said Svedin.